This page on the Web site of the American Psychological Association provides reports on such matters as work stress and the joys of napping on the job. Where to work? What to do? We discovered Web sites describing some of the country's best workplaces, "psychologically healthy" companies, and some of the worst jobs that people continue to endure. Best employers. Search no more. The best company to work for, at least according to Fortune magazine, is Google Inc. Fortune's list of the 100 top employers includes two supermarket chains - Wegmans Food Markets Inc. and Whole Foods Market Inc. - in the top 10. If you're looking for a job, you can search the list by state. Sweatshop history. The Smithsonian Institution's National Museum of American History provides an online view of its exhibit about sweatshops in the United States from 1820 to the present. How about reviving this definition from a dictionary of 1895: "Sweater: employer who underpays and overworks his employees. . . ."
Core trouble. A study dubbed "Rotten to the core," from the University of Washington, says the bad apple is "one person whose negative behavior affects the rest of the group." The study was prompted by an incident in which the departure of an unpleasant coworker dramatically improved working conditions. Low-wage America. Revisit a 2004 radio series by NPR on low-wage jobs, such as sewing-factory workers, public-bathroom cleaners, and various low-paid writers whom we relate to. American psych. 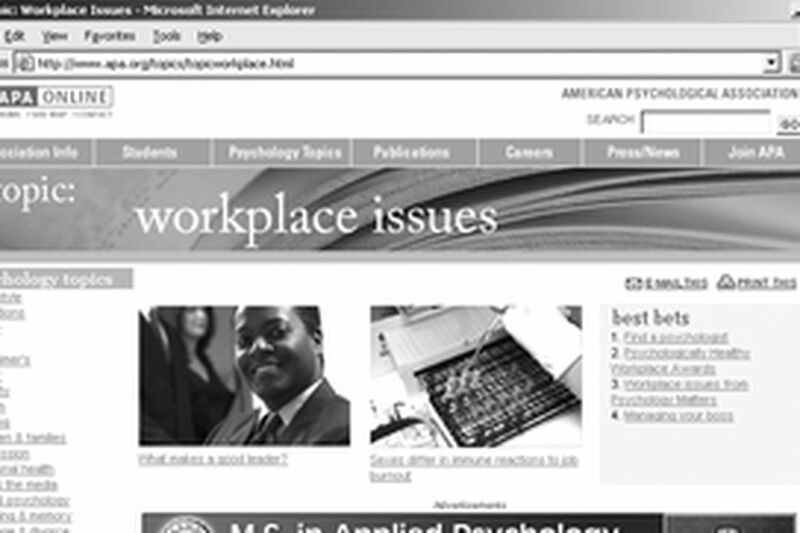 A workplace-issues page on the Web site of the American Psychological Association provides news reports on such matters as work stress and the joys of napping on the job. In March, the association will announce its Psychologically Healthy Workplace Award recipients. Last year's winners included International Business Machines Corp.'s T.J. Watson Research Center, and the Green Chimneys School, a special-education facility in Brewster, N.Y. One state-level winner was Analytical Graphics Inc. in suburban Philadelphia.